Prior to completing clinical training in counselling psychology, I had the opportunity for theological training and a few years of pastoral experience. Over the past forty years, this has afforded me the opportunity to use this combination of training to serve those in training for pastoral ministry, those in pastoral ministry and those serving in non-government organizations in many countries of the world. In the years in which I have had opportunity to use the Highlands Ability Battery, I have employed it as an effective instrument along with other instruments including the MMPI, 16 PF, Myers-Briggs and other instruments designed to assess resistance to stress and the treatment of stress-related symptoms. The HAB has proven useful in many ways. It brings the same benefits to College Students preparing for ministry as it does to other college students. I have used it in helping to determine the giftedness of pastors wishing to engage in the specialized areas of pioneering churches in new communities. There are many dimensions of the HAB that identify people who are likely to engage in the adventure of shaping new church opportunities. The normal pastoral experience invariably involves the trauma of transition from one ministry to another, usually several times along one’s career path. The clarification of where to put one’s energy for the most effective use of one’s abilities as one progresses along the normal path of adult development is greatly facilitated through the use of HAB. At times the transition is prompted by factors other than adult development. These may include conflict, change in communities, movement by denominational leader, family or personal variables and other factors. It is abundantly clear that one’s communication style, problem solving abilities and pattern of processing information is of great importance in addressing situations of conflict. Clarifying one’s abilities for such change as well as general adaptability and resilience are often helped by the use of HAB. One area where HAB has contributed significantly is that of team building. In growth situations where it becomes necessary to add staff positions, it is important to identify the complimentary nature of the gifts and abilities needed to meet the demands of a changing and growing opportunity. Using the HAB as an instrument to clarify the most effective combination of abilities required in a given church community is a productive experience. More recently, I have discovered the use of HAB in assisting myself and others who have entered into the ambiguity of retirement. When one has used his abilities and gifts in vocational ways and, then, moves to retirement, it is necessary to discover how his abilities can continue to be expressed in volunteerism or hobbies in his later years. The gains and losses must be faced realistically. The peculiarities of working, on the front lines, in intimate relationships with other cultures has its special and unique demands. It becomes apparent that some personalities and some abilities appear to make one more adaptable to the cross-cultural adventure of serving in complex, different and, often, poverty- and sickness-ridden places in our world. Charitable organizations will often bring together international members. This brings a unique complexity to the leadership of such organizations. The mix of cultures among those serving is no less taxing than addressing and living with the culture in which one regularly serves. People choosing to expose themselves to the risks of these opportunities benefit from learning the scope of their abilities and from discovering how these will impact their resilience. 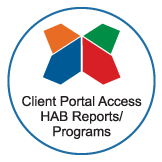 HAB has been of great value to me in working with those engaged in these opportunities.